How to apply eyeshadow? Eyeshadow is a must-have for every girls and women out there because without it the cosmetics section would be incomplete. They make the eyes look beautiful and they can be bought with just a few dollars. They are of many types like plain color, glittery, matte etc. and there are many renowned manufacturers making them. They come in many sizes. There are eyeshadow palettes with over 100 colors and there are single color eyeshadow boxes. If you are going on a trip, take the small palettes or the basic color you think you will need. While you are at home and going to an event or a part, bring out your best palettes and brush and start applying. Here is how to apply eyeshadow. Step 1: Find out your eye shape. It will make the process much easier. Many people make the mistake of thinking that all eye are similar and all require same techniques. Your eye could be of a certain type and you need to learn to use eyeshadow according to it. It could be deep-set eyes, protruding eyes, hooded eyes or double lids. Check whether when you open your eyes, are the lid and crease visible or not. Step 2: Buy the brushes you need. You will need at least some these brushes: highlighter brush, pigmentation brush, softening shadow brush, blending brush and smudge brush. They are usually available in sets in the cosmetics store. You will know that the big one is the highlighter brush, pigmentation is the second smallest one, softening shadow is the one that is the tallest (the brush tip is longer than others), the blending brush is the one that is shaped like a “U” and the smallest one is the smudge brush. Step 3: It is time to pick out the color you want to apply. You can start with an eyeliner. Apply the primer. Remember that you will need to use four colors. For example, if you are going with grey eyes. Apply four shades of grey. The lightest one will be at your brow bone, the second lightest shade of grey should be on your lid, the second darkest grey should look good in the crease and the deepest grey should be at the external corner. Step 4: Start with closing one eye and looking at the mirror with the other eye. It is better to first look at how much is visible. You can mark the visible part and start using the eyeshadow. Use your brush according to the requirements. End off with a mascara to make the eyes really stand out. It is better to avoid contact lenses. Eyeshadow and mascara are enough to make the eye look pretty. 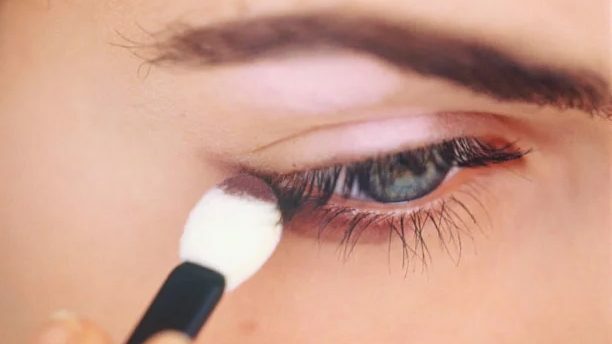 Step 5: Some people apply the color of their dress, suppose you are going to a party in a brown dress, you will obviously choose brown colored eye shadow. It is perfectly fine though, if you opt for a light pink color and finish off with silver glitters on the eye. You should check whether the eyes go with your outfit after you are done.